After we posted the list of the best and worst performing hedge funds in 2018 as December last week, there has been one prominent change: David Einhorn's Greenlight suffered another major drop last month when he lost an additional 9.2%, bringing his full year 2018 performance to a staggering -33.9%. 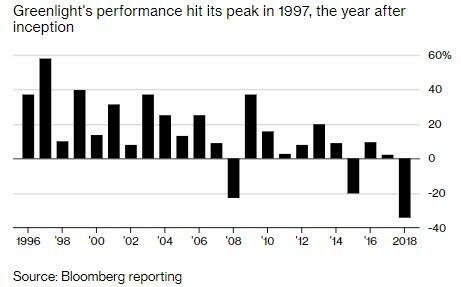 This, according to Bloomberg, was the biggest annual loss in Greenlight's 22 year history - surpassing 2008, its prior worst year on record, and far worse than its 20% drop in 2015 - and potentially a death knell for the value investor. In what was an absolutely abysmal 2018 for Greenlight, the fund posted positive returns in just two months, May and October, and underperformed both the broader market, which dropped 4.4% in absolute return terms, and its benchmark, the HFRX Global Hedge Fund Index, which was down 7% in 2018. 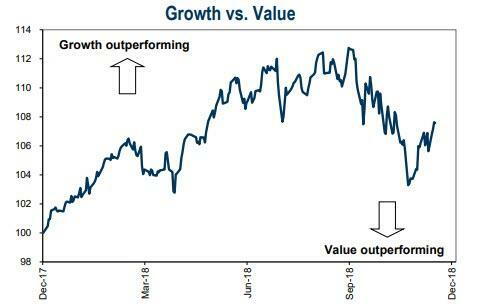 Despite a modest rebound for value investing in the past three months - which has seen dramatic underperformance relative to growth strategies in the past decade - various other prominent value investors also suffered in 2018 "as a decade of historically low interest rates and the rise of passive investing and quant trading pushed growth stocks past their inexpensive brethren." Some, such as Three Bays Capital and SPO Partners closed in 2018. Einhorn has repeatedly expressed his frustration with the poor performance this year, while remaining steadfast in his commitment to value investing. In its monthly update the hedge fund also noted that it was 121% long and 65% short as of the end of December. According to its latest 13F, Greenlight’s biggest holdings as of Sept. 30 included Green Brick Partners, Brighthouse Financial and AerCap Holdings NV, all of which tumbled more than 25% during the fourth quarter even as some of its biggest shorts outperformed, most notably Tesla, which was up 26% in Q4 even as Einhorn told investors the third quarter will be "as good as it gets" for Elon Musk's carmaker. Understandably, Greenlight has been shedding assets at a disturbing pace: as of May, the firm - which started the year with $6.3 billion in AUM - was down to $5.5 billion, less than half of its 2014 AUM when for the first time in years Greenlight opened to outside investors and quickly drawing more than $1 billion in new cash. Subsequently, in July, the WSJ ran a piece about how many of the fund's investors had had enough and hit Greenlight with a barrage of redemption requests. When clients asked Mr. Einhorn for his views on investments, he often chafed, several investors said. While he revealed the firm’s five largest “disclosed long positions” monthly, he wouldn’t say whether there were other large positions or significant bearish bets in the portfolio, nor would he give midmonth updates as many funds do, these investors said. And according to Bloomberg, with redemptions and losses, it may start 2019 with well under $5 billion under management. According to an LP familiar with the fund's plans, Einhorn will follow many other prominent investors who have been unable to generate alpha in the current market and will return outside capital as he soon winds down, converting into a family office.